Come down to Cambridge Junction on Friday and Saturday 6-7th July, to see some exciting new theatre from the UK, Ireland and Czech Republic. Young UK company, Night Train, premiere their innaugural piece, Maklena. From Ireland we welcome back Fishamble with 2 shows, Silent and Underneath. And from the Czech Republic, with a world premiere of Untitled we host Divadlo 6-16 Prague, featuring leading Czech performer Milena Steinmasslova. Full detail of the whole festival, which also features workshops, readings and community performances, are available here. Following success in Edinburgh our production of Four For Jericho has been invited to the prestigious Think Fest in Goa, India, in November. see http://goathinkfest.com/default.aspx for more details. 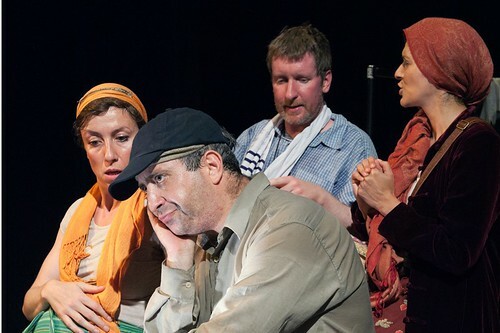 Farce, comedy and physical theatre combine to provide both a smooth blend and an explosive mix in Menagerie Theatre Company’s excellent examination of the reality of life for those of the various religions which have an interest in the West Bank. The company’s physical style of story-telling, choreographed with flair and precision by Patrick Morris, throws you straight into the tale. Michael is on a mission to film the Holy Lands for his church’s Sunday School class, his naive blundering fuelled in no small part by a desire to please his estranged wife. Paul Brendan is utterly believable as Michael, as his naivety takes him away from the tourist track and into the hills of the occupied territories. Here he encounters Chandrika Chevli’s humanitarian observer Izzy – and her Arab academic Dr Reem – Josh Becker’s Palestinian farmer Fouad and Emma Beattie’s very-pregnant settler, Rachel. 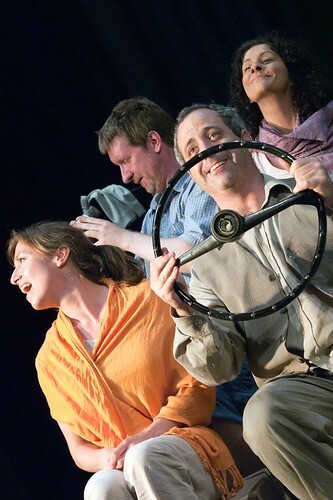 Without going into the complexities of the whole Arab-Israeli conflict, Richard Fredman’s script succeeds, in what ends up as a tall tale of a taxi ride shared by the conflicting characters, in highlighting exactly how complex the whole situation is. There can be no happy ending, if veracity is to be maintained, and Fredman ensures that there is none, while keeping the energy high in getting there. With much swapping of roles, Menagerie theatre company conjures up a whirl of dust, check points and olive trees from almost nothing . With only breeze blocks for a set, this piece is inventive and clever, offering no easy answers to the ongoing struggles between Israel and Palestine. A taxi heads for Jericho with a Jewish settler from New York, a Palestinian, an Englishman and an anthropologist all squashed together for the ride. 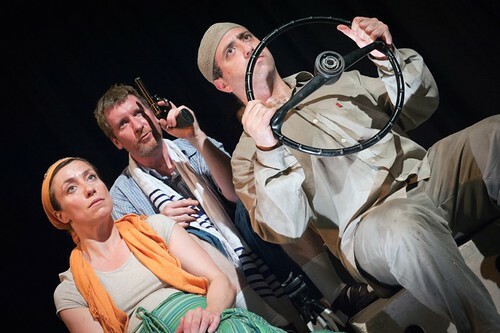 In a funny and well choreographed farce, guns, babies and camera swap as the tension rises. Characterisation is witty and knowing and stereotypes are constantly shifting. Human rights activist Izzy throws herself in front of every bulldozer regardless of consequences and when the brilliantly rude Jewish woman is in danger it is left to her Arabic traveling companion to come to the rescue. Another level is provided by Dr Reem Quaddum who proposes ideas for her research projects as they hurtle towards disaster; her use of Hollywood films as reference points providing a hilarious and a well placed dig at detached academic commentary. Told from the point of view of the hapless British tourist, carefully placed historical information ensures that audience can follow the arguments and the climax refuses to simplify its subject. This is a multi-layered and energetic approach to a complex issue and it strikes a balanced note between entertainment and serious discussion. A stunning whirl wind of comedy, politics and physical theatre, Four For Jericho is a provoking and entertaining delight. The play opens and closes with narrators addressing the audience and making the performance feel intimate and safe. They delicately invite you in to engage and ponder all issues highlighted by the show, making the piece feel urgent and personal. Incredibly effective moments constantly spill across the stage, repeatedly contrasting one another; a snippet of passion and excitement is followed by a streak of terror and confusion, a bustling and busy market place is placed aside a stark and haunting elongated flash. Each climactic point is transfixing and utterly intense, often accompanied by a dusting of intelligent subtlety which continuously adds texture and insight. The completely convincing creation of a taxi, using just four blocks and a steering wheel, exemplifies the innovation of the piece. Despite beginning to drag and feel repetitive at times, the taxi construction provides a connecting line for the entire performance, a comfortable mould for the remainder of the piece to fit into. The farcical tension at the core of the piece is cleverly crafted, using a combination of comedy, irony and innovative symbolism to create an explicit and interesting effect. Additional bizarre and eccentric fragments enhance the intensity at the root of the piece. Each character, combined with their ability to be interchangeable, has a deep and full audience connection, breeding empathy and understanding. Their opinions and hopes feel meaningful and compelling; however, the complexity of Michael’s relationship with Marie feels undeveloped and unresolved. Menagerie has complete command of their stage, successfully and innovatively entwining their very simple set and costumes with stylistic lighting and voices to create an utterly believable middle-eastern world. They work together seamlessly, with uncompromising energy, making their performance smooth and full of enthusiasm. The piece stretches so far, exploring countless concepts and issues. It begs you to consider, for example, the intricacies of unquestionably obeying orders and behaviours, the tensions between idealism and reality, the dangers of stereotyping: all topics shaping a world which will inevitably “go into rewind” always repeating the same mistakes. Peacefully still and artistically moving, the close of the performance holds an inquisitive and haunting air. Four For Jericho has started today at the Pleasance in Edinburgh. Click here for more information. Click here to book tickets now! Sparks 2011 finishes – Thank you! We are just coming down from a highly successful Sparks event last Sunday (July 3rd) at The Junction. Billed as a ‘New Writing Immersion day’, it lived up to its name with ceaseless activity from 10am to 8pm. Sarah Dickenson, from Soho Theatre, ran a fabulous workshop to kick off the day, and this was followed by an inspiring April de Angelis masterclass. Both attracted a great variety of writers who had travelled from far and wide to be with us! Following these, we had the three rehearsed readings of new plays in progress: Foxfinder by Dawn King, The Plan by Laura Watson (Junction-supported artist), andGirl Walks Into a Bar by Matthew Wilkie. All 3 plays had feedback and questions from the audience – not always an easy thing to undergo, but truly beneficial to the writers as they ponder future development of their work. Hats off to Literary Associate Jacqui Honess-Martin who read every page of over 150 scripts submitted to Sparks, and who worked most closely with the featured writers. Finally, a huge thank you to all who supported the event through their work and participation. Master-class With April De Angelis, acclaimed playwright (RSC, RNT etc) £20/£15 Concessions. This is a practical playwriting workshop for all writers who have some experience of writing for the stage. April began her career in theatre as an actress in the 1980s before turning to writing plays in 1987. Since then her work has been presented by every major British theatre including the Royal Shakespeare Company, The National Theatre, Hampstead Theatre, Out of Joint and the Royal Court. Her fourth play for the Royal Court will be produced in October 2011. She is also under commission to the National Theatre and the Manchester International Festival. April was the previous director of the Masters Degree in Playwriting Studies at Birmingham University and has led Royal Court workshops for the International Department in Latin America, the Middle East, India and Russia.